Kaffir lime trees are members of the citrus family, and just like all citrus, they are sensitive to freezing conditions. For this reason, it is best to grow a kaffir lime tree outside in the warmest, tropical regions of our country. It grows best outside in Zones 9 and 10. If you live anywhere else, grow the lime tree in a container so you will be able to control its growing conditions. Kaffir lime trees are hardy growers once they have established themselves, and gardeners should find very few problems associated with them. Select an area in your yard that receives full sunlight throughout the day. Kaffir lime trees will not do well growing in shady conditions and will eventually die. Plant the kaffir lime tree in soil that is acidic and drains well. They will grow well in sandy soils. Planting the tree in soil that is dense, such as clay, will retain too much water and the lime tree will develop root rot and die. There is no need to amend the soil with organic matter. Select an area that is large enough for the tree to obtain its maximum height of 10 feet. It can also develop a width that is as wide as it is tall. Be sure the tree is not planted in an area where it can interfere with structures or power lines. Water the kaffir lime tree every other day for the first two weeks. From then on, water the tree on a regular basis, but do not continuously keep the soil flooded. Fertilize the kaffir lime tree twice a year with a high-quality citrus fertilizer. Fertilize the tree once in early spring and then again at the end of summer. Select a container to place the kaffir lime tree that is three times bigger than the container the tree was purchased in. The tree will need plenty of space for the roots to spread out and not be bunched. Otherwise, the tree can develop round root, which is a condition that happens when the container is too small. The tree can become stunted and never grow properly. Fill the container with a well-draining potting medium, such as a potting mix with sphagnum in it. If you use straight potting soil, the medium will be too thick and not drain properly, leading to root rot. Place the container outside or on a porch during the warmer months. When the weather is turning cold, bring the container inside to a protected area. Water the container regularly, but do not keep it continuously flooded. Use a water-soluble fertilizer on the lime tree once per month. Set the container outside during rainy weather so it can benefit from natural humidity. Kaffir lime trees grow best in humid conditions. 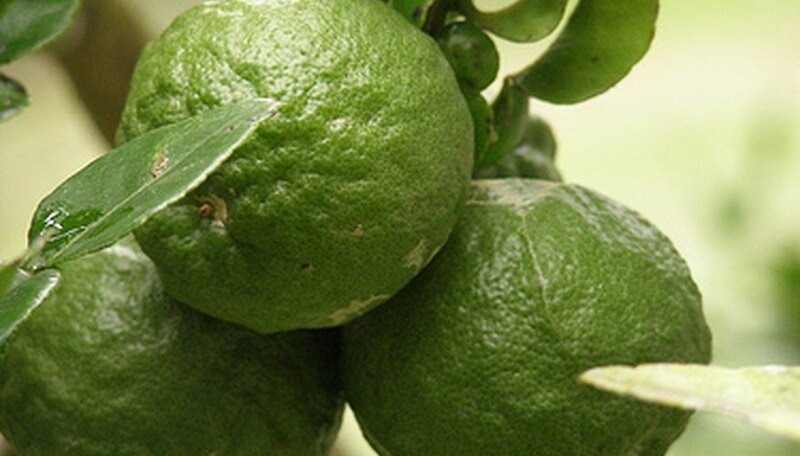 The kaffir lime is a relatively problem- and pest-free citrus tree. Kaffir lime trees have spiny edges, so be careful when handling it.